• Maximum possible sale price for your business. • Maximum personal wealth – before and after the transition. • Maximum net proceeds through good tax planning. mentally and financially for this transition. Peter Hickey, the author, has developed a revolutionary concept to exit planning. 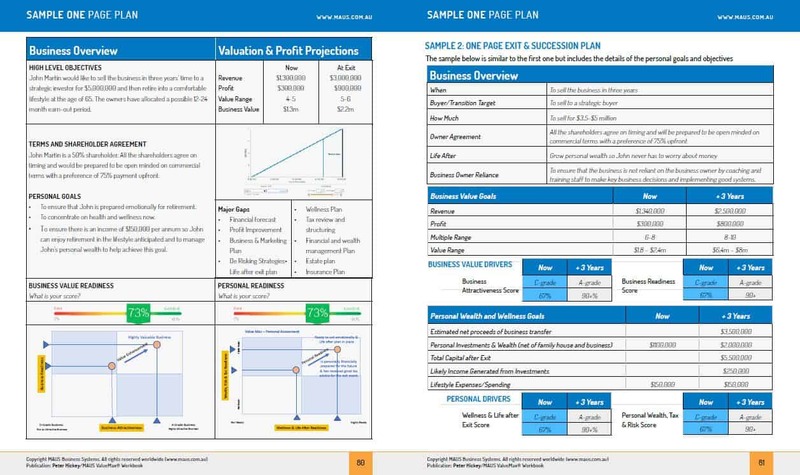 He introduces the One Page Exit & Succession Plan which is a method of clearly articulating your high level goals into a One Page Exit plan. 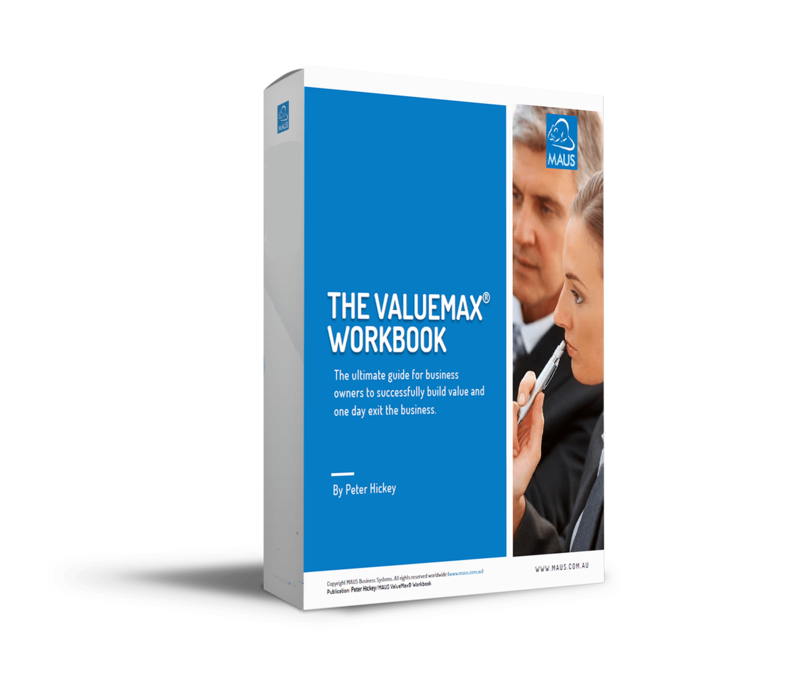 • Start at the beginning of the workbook and work your way through each module. • Write your goals and objectives at the beginning of the process, but as you progress through the analysis templates, come back, revisit and update those objectives. • Planning is not a linear process. It should evolve as your business and personal situation changes and as your thought processes become more mature. • The workbook is designed to promote conversations and discussions with your family, staff, advisors and other co-owners of the business. • We suggest internal workshops could be used to facilitate discussions with employees and discuss business improvement. • We suggest you consider appointing an Advisory Board to keep you on track and hold you accountable to this plan. 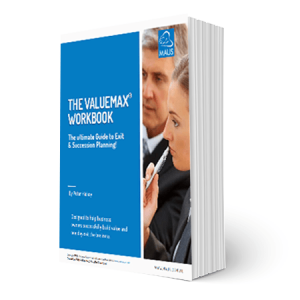 This workbook was designed to fit in with established methodologies in the marketplace. It can be used to complement the Exit Planning Institute Framework and the MasterPlan and Value Acceleration methodologies. At the back of the book we have included a mapping process that maps the modules in this workbook to the above-mentioned methodologies. 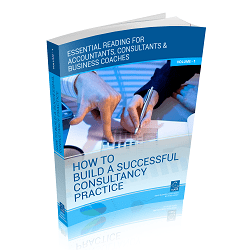 This guide was largely written from over 25 years of first-hand experience in running a business and then working with consultants, accountants and the legal fraternity to buy and sell businesses. It has become almost a life work to evolve, develop and innovate a set of processes that can be used by business advisers and business owners around the world. From due diligence requirements through to different valuation strategies, I have learnt from all the people with whom I have worked. Throughout this time, I have negotiated with multinationals, and engaged with both professional brokers and the top five accounting firms. I have talked to respected financial houses, brokers, venture capital companies and legal firms – each of whom have added to my thought processes and introduced me to their own methodologies. I have had the great fortune to meet and befriend many great opinion and thought leaders around the world. Peter Christman, one of the founders of the Exit Planning Institute; Chris Snider, the current President and Owner; and Sean Hutchinson, an extremely generous practitioner, I put high on that list in the USA. All have done significant work in building the industry and have influenced me over the years. I was so impressed with the Exit Planning Institute’s work in educating business owners that I became the first Australian to fly to Chicago and receive the Certified Exit Planning Advisor Credential (CEPA) and I am now the current President of the Australian Chapter of the Exit Planning Institute. I founded the Institute of Exit Advisors in Australia in 2005 but decided to support an international credential, so abandoned the IEA. When I first started writing in this area, I found that many of the templates simply did not exist in a centralised area and there was no clear step-by-step pathway. I also found there were gaps in fundamental areas relating to educating business owners about the processes – especially in keeping the language simple and practical. I thought it was a real breakthrough when I developed in 2003 the Business Attractiveness and Exit Readiness Index – giving business owners access to a scoring a system. Over the years, I have given seminars, held workshops and consulted to literally thousands of small to medium-sized businesses (SMEs). I have been at the coalface, and what I have learnt can now be found in the practical checklists that appear in this book. Through my years of experience, I know these checklists are effective in improving the bottom line and hence the sale value of any business. I thank all those that have contributed to my learning journey. Thank also to the Contributing Editors, and Clare Loewenthal, who in the early days translated some of my videos. I also left some checklists in the back of the book that were particularly good that were developed by MAUS/CCH/EBC Editors over the years. And finally, thanks to my family – without whom there would be no purpose to what we do in business!